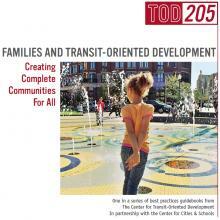 The planning manual, “TOD 205: Families and Transit-Oriented Development – Creating Complete Communities for All,” is one in an ongoing series of best practice guidebooks from The Center for Transit-Oriented-Development and was completed in partnership with the Center for Cities & Schools. Designed for planning professionals and municipal leaders, the manual presents steps municipalities can take to ensure that TOD initiatives support family-friendly communities and high-quality education. Typically, TOD projects appeal to young professionals, empty nesters, and other households without children. However, families with children also will seek to live near transit in “complete communities” that better accommodate the needs of these families. The manual lists ten core connections between TOD and families that help create complete communities: (1) access to high-quality educational opportunities; (2) a wide mix of housing types with multiple bedrooms and mixed-income housing; (3) collaboration with local school districts to plan for impacts to school enrollment; (4) access to academic enrichment activities; (5) access to the increasing number of school options; (6) workforce housing for high quality teachers; (7) pedestrian-friendly, vibrant, and safe streets; (8) mixed uses that provide family-serving amenities such as libraries, community centers, child care, grocery stores, and other shopping venues; (9) shared use of public space, especially school amenities; and (10) incorporation of new schools within TODs. To guide TOD planning for complete communities, the manual then describes seven major action steps to creating TOD that supports family-friendly communities and high-quality education. These steps highlight helpful local case studies, as well as specific actions planners can take. Step 1 emphasizes understanding the educational options and policies that affect housing choices for families and suggests mapping school district jurisdictions, identifying key leaders, researching school assignment policies, understanding school priorities and community assets, and determining existing school capacity and plans for new construction or renovations. Step 2 involves identifying critical junctures for engaging school district personnel, engaging parents and students, and educating them about transit. Step 3 suggests creating a public, shared, and comprehensive vision statement accompanied by benchmarks to gauge progress after later steps. Step 4 underscores the importance of providing a mix of services with TOD, including comprehensive social services and family-oriented amenities, such as early learning programs, high-quality child care, and healthy living environments. Step 5 emphasizes the importance of building cross-sector partnerships to coordinate capital investments in schools, housing, transportation, and neighborhoods. Step 6 calls for better integration of transit with educational opportunities by making areas around schools safe for walking and bicycling, siting schools near transit, coordinating transit service with peak school times, and creating incentives for transit use. Finally, step 7 prioritizes institutionalizing these partnerships and collaborations.